Best Nail Place: Golden Nail Spa. You see that flower? That's hand-painted, baby. Bee tee dubs, there's still time to vote before June 4. Click here to vote online. 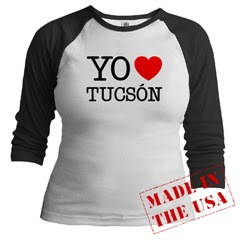 Best Local Blog: Tucson Querido shamelessly self-promotes here. Best Park: Reid. Recently as I was flying back to Tucson I noticed just what a huge green patch it constitutes in the middle of our desert town. Best Bowling Alley: Lucky Strike. Cosmic bowl rocks! Best Fine Art Gallery: DeGrazia Gallery in the Sun. I love it because of DeGrazia's incorporation of native elements, but I also have a problem with some of the rhetoric found there, such as the idolatry of Kino as beneficent Indian savior, etc. Best Local Performing Artist: Jose Pepo Saavedra. Last chance to vote for Pepo, because by the end of this summer he won't be local anymore. Boo hoo. Well, before he moves closer to the city that doesn't sleep, he's giving a last show on June 13. Best Pizza: Zachary's. Two pieces does me. Plus, I dig the weird beer garden in the back. Best Ice Cream: Frost. But actually it's gelato. Best Fish Tacos: Rubio's. But they are not as good for you as you think. Best Outdoor Seating: Cushing Street. Try the Sueño Burger. Best Late-Night Eats: The Taco Shop Co.
Best Mexican: Crossroads, for the nopalitos. Best Used Books: Bookman's. Duh. Best Laundrette: Campbell Coin Laundry and Cleaners. Their slogan is "Where Cleaning Your Clothes Can Be A Pleasant Experience". It's true. The owners and employees have always been nice. Andrew and have our "laundry date" there every two weeks, combining clean clothes, sushi, video games, enchiladas, frozen yogurt, manicures and other fun things the strip mall has to offer. Girls Bike Out Ride and Photoshoot This Sunday!